Get all of the latest news from Sugar + Wine! Simple, delicious recipes from my kitchen to your table. Summertime is full of life, sun, and fun. While fall is my favorite season, summer comes in a strong second. I love the events, the local county fair, the pool time and the early morning summer walks with my pup. As I’ve mentioned before, I’ve been busy. Actually, this is probably been one of the busiest summers I’ve had in a while. I just got back from a conference in Las Vegas. I’ve been in Denver. I’ve been to theme parks, water parks, and sunning by the pool. I’ve tended to the garden, and of course, I have been cooking up some new recipes. Summer has been warm so spending loads of time in the kitchen is out of the question. 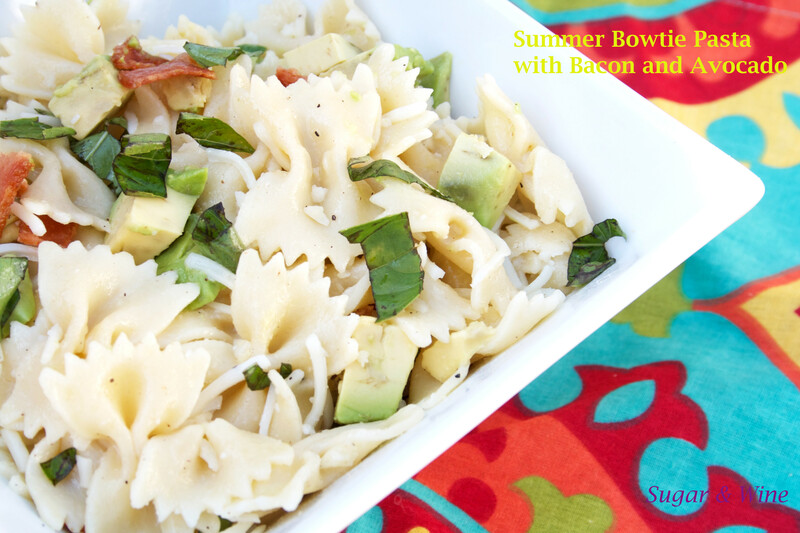 I’m sure the same has been for you so today I’m sharing my signature recipe—Summer Bowtie Pasta—and it is a pasta that can be fixed on short notice. My mom cheers when I even mention making this recipe. I take it to parties and there’s rarely leftovers. Oh, and even kids like it. My Summer Bowtie Pasta is pasta you can actually eat in summer. It’s not too heavy and has a fresh citrus taste that’s perfect for a summer dinner. It doesn’t hurt that it has bacon, avocado and cheese in it either. Boil the pasta according to the instructions on the box. While the pasta is boiling, prep the rest of the ingredients. You can fry the bacon but I actually go the quick way and microwave it until crispy (about 5-6 minutes). You want the bacon to cook evenly and be crisp so choose your preferred cooking method accordingly. Chop the garlic and basil, and slice the avocado up. Mix together the olive oil and lemon juice. Once the pasta has drained and cooled a bit (you need to let it cool so it doesn’t melt the cheese), place the pasta in a bowl and coat the pasta with the lemon juice and olive oil mixture. There might be a little extra sauce at the bottom but trust me, it will absorb and it needs it. Crumble the bacon, add it and the garlic and basil to the pasta. Salt and pepper to taste and mix all the ingredients together with the pasta. Add the cheese and avocado and lightly toss. Ta da. Dinner’s done!